Description: High Level Disinfecting Solution. 1. Remove one (1) monitor strip from bottle. Be sure to re-close the bottle tightly. 2. Dip the entire pad end into the solution and withdraw immediately. Do not leave the pad in the solution or stir or agitate the pad in the solution. 3. Remove the excess solution from the pad by touching the end of the pad side edge of the strip on a paper towel. Do not blot the pad or shake the test strip to remove excess solution. 4. Lay the wet strip, pad side up, across the bottle cap so that it is balanced. 5. Wait for five (5) minutes for color development. Do not allow the strip to develop for more than eight (8) minutes. After eight (8) minutes the chemical reaction could begin to reverse itself resulting in a false negative reading. 6. Any shade of uniform yellow on the pad indicates an effective solution concentration. If any white color remains inside of the pad box, the solution is ineffective and should be discarded. Description: Sklar-Cide 28 HLD provides an efficient and safe means for the high-level disinfection or sterilization of medical, ophthalmic, dental and surgical devices including endoscopes and lensed instruments. 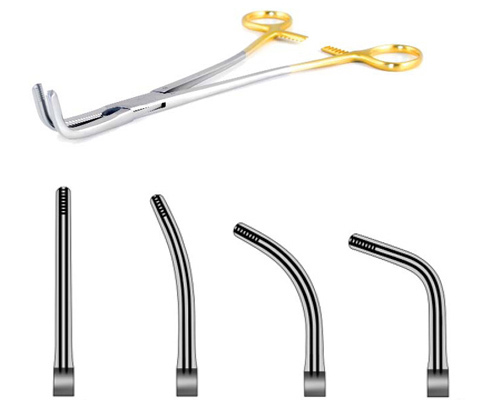 As with all liquid sterilants, this product should be used for instruments and devices that are heat labile or otherwise incompatible with other methods of biologically monitored sterilization. 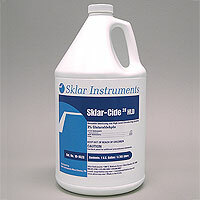 Chemistry: Sklar-Cide 28 HLD is an activated gluteraldehyde liquid chemical sterilant and high- level disinfectant. Its active ingredient is gluteraldehyde in a nominal concentration of 3%. When the powdered activator is added, the solution turns green in color to indicate its readiness for use. In addition to the active ingredient, the ready to use solution contains buffers, wetting agents, a rust inhibitor and a pleasant fragrance. In as little as 25 minutes and complete sterilization in 10 hours at room temperature (25° C). dried on flexible fiber endoscopes.